First time I tried Yoga it was in Los Angeles. At one of the most popular studios in Silverlake. I loved it, because it was intense and the studio was unconventional. 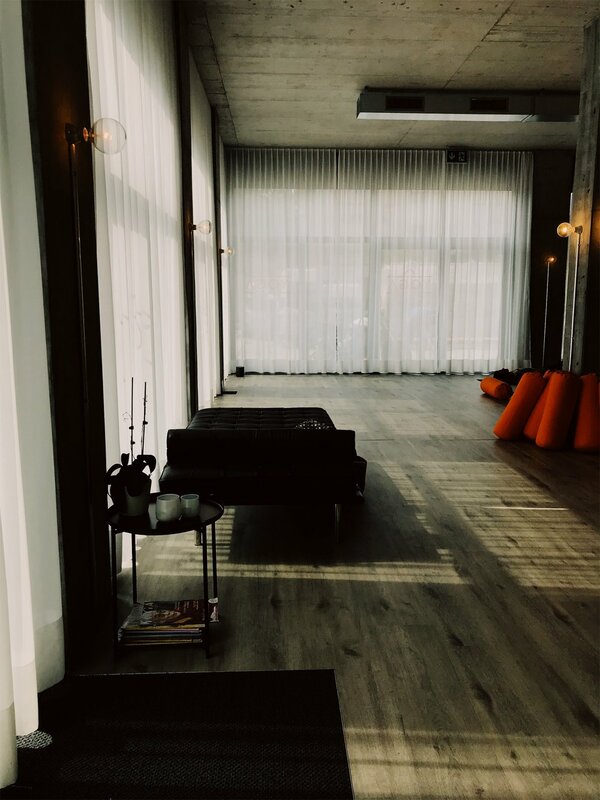 When you first think of a yoga studio you might be biased, so was I. Moving back to Zurich, I missed a lot of L.A. lifestyle. Especially the workout part. That's why I am always happy about openings. When something brand opens up. Let me introduce you to one of my new favourites here in Zurich, and I also interviewed the owner about the upcoming seasonal change from summer to fall / winter. (further bellow) - this might help you through the grey and hopefully make colder days more pleasant for you. YOGA IN A BAG just opened it's doors a few weeks back. I first found it on Instagram and realised that it's pretty close from where we live. A studio exactly after my taste. One of the things I like about that place: it's very detail orientated and neat. There are healthy snacks on the bar and for the relaxation part of the class you can put a calming lavender pillow onto your eyes. It's wellness! There's an interview (after the pictures) with hints and tips on how to keep the summer glow and stay relaxed through the winter season. I ones read, that practicing inversion poses daily is supposed to be healthy for our body system, why? It improves the blood circulations and the whole organism gets better provided oxygen and essential nutrients. The increased blood supply stimulates our digestion. Through the lung compression our respiration deepens, it strengthens our lungs and increases the oxygen absorption. It relieves our vertebrae and eases the pressure onto our spinal disc. It improves our core muscles and our posture. Can we prepare ourselves with yoga practice for the colder winter months? Yoga strengthens our immune system and muscles. It relieves tension. It boosts our metabolic system and stimulates our digestion. It adjusts our hormone production and leads to a stable bloodstream. Yoga helps us to be less prone for infections. It leads to a healthy wellbeing and helps us through dim rainy days. Yoga helps us to dissipate blockades. Movement relieves stress hormones and raises our endorphins > mood booster! Yoga increases the blood circulation which functions again cold hands and feet. When we all in all feel well in our skins and accept the season as it is, then we can physically better deal with it. Which yoga poses do you recommend for a home workout session? Practicing yoga at home (or wherever you are at) is a very nice thing. You can basically choose the exercises according your mood. It's more important to practice on a regular basis. Rather three shorter sessions a week than only one long session. The regularity will help you make the yoga practice to your habit. Don't stress yourselves out. Respect your individual boundaries and your daily condition. Yoga exercises should always feel good and never generate pain. Visit classes on a regular basis to avoid a false posture. How can I fight an internal disquietness / tension? Movement reduces stress hormones and grows happiness hormones! Yoga increases awareness. We get to know and feel ourselves better and this let's us better deal with tension. Athletic and breathing exercises operate redeeming onto our whole system. Calming exercises (such as bending forward, balancing breathing exercises) can specifically be used to reduce tension. Yoga helps us to practice relaxation! Everyone is individual, and we all need something else to feel better and relaxed. It might be an intense yoga workout or just a very calm class. Yoga in a bag is concerned to offer a wide variety of classes, so we can accomplish the needs of many!